The 2013 Steam Indie Spring Sale Is Here! Spring is here, and that means it's time to get our your money and throw it at Steam. On the off-chance that you have any money left over from the last Steam sale, it's time to brace yourself for the next Steam sale - the 2013 Indie Spring Sale, to be precise. As you may have sussed out from the name, this one is all about indie games, and being a Steam sale, the deals are pretty freakin' awesome. That's just a very small sample of what's available, but you know how Steam rolls. There's all kinds of stuff: new releases, old favorites, award winners, even bundles - you can pick up the entire Amanita Collection, which includes Samorost 2, Machinarium and Botanicula for $7.49, or To the Moon plus the soundtrack for $4.99. Good games, and lots of them, on the serious cheap. 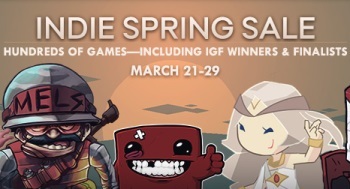 The 2013 Steam Indie Spring Sale runs until March 29. You're welcome.